St. George incorporation movement must be happy the 2014 regular session of the Louisiana Legislature is over, because they had to spend a lot of time and effort working to defeat three bills that could have hampered or even ended the incorporation movement. As recently as last Friday, one of the anti-St. George bills was very much alive. But ultimately, all of the bills designed to delay or derail the St. George movement were themselves killed. • HB 768 by Rep. Price. This bill would have limited the time period for gathering petitions to call an election on incorporation to 180 days. The St. George effort has already gone far beyond six months. Price’s bill was amended in the House Committee on Municipal, Parochial and Cultural Affairs to remove most of strict time delays. It then passed House on a vote of 91 to 1. In the Senate, the bill was referred to committee where it died. • HB 1212 by Rep. James. This bill would have allowed the vote on incorporation to be parishwide instead of in the proposed city. This bill passed out of committee but the votes weren’t there to pass it on the floor, and it was abandoned. • SB 674 by Sen. Nevers. This bill would have placed a two-year moratorium on incorporation and would have effectively stopped St. George. It was amended in the Senate committee to allow St. George to be on the ballot this November but not thereafter for two years. This bill passed the Senate and the House committee but died on the House floor. 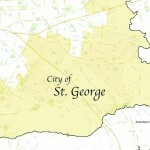 As a result, the proposed City of St. George is alive and well!